Belgium surprised me in a lot of ways. This small country, about the size of Maryland (or the Basque Country autonomous community (not Euskal Herria, which is bigger) has a lot to offer. Although I saw a lot during my short time there, I know there are a lot more things to see. There are more waffles and chocolate to try, and if I could just make myself like beer (I’m a total wine guy…don’t like the taste of beer), there are a ton of beers to try. That’s the thing about traveling. You always miss out on something cool no matter how well you budget your time as there is just too much to see in this world. It’s impossible to see it all. 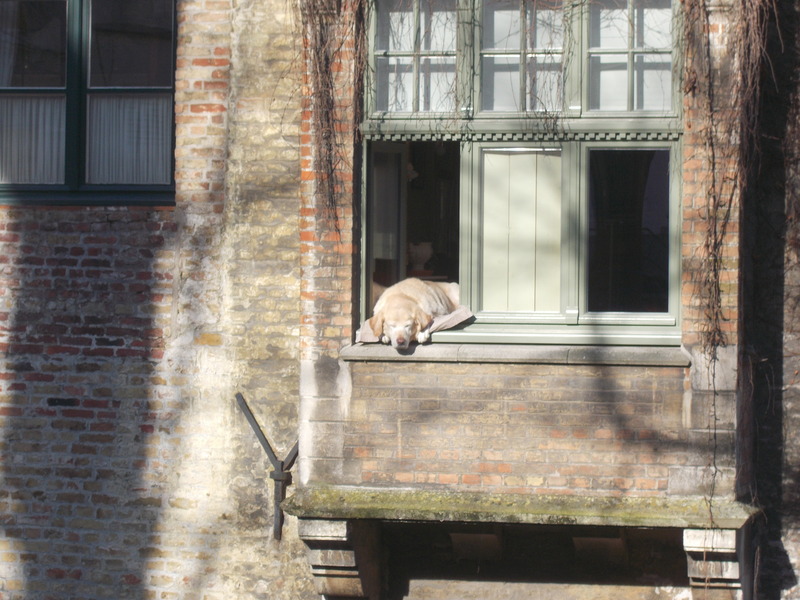 Bruges (Brugge/Brujas) was by far my favourite city. The medieval feel combined with the canals makes it an awesome destination. Antwerp, the City of the Biscuits (British for cookie) was my second fave. It has 510,000 habitants but wasn’t too big or too small. It has the World’s Most Beautiful Train Station (so they say). 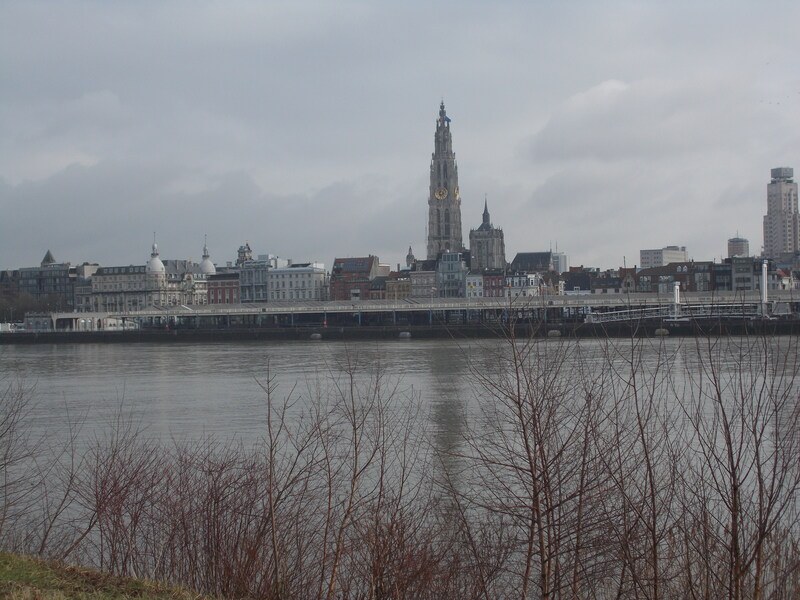 Legend has it that Antwerp got its name from an evil Giant who demanded a toll to cross the river, and for those who didn’t pay, he chopped off their hand and threw it into the river. The giant was named Antigoon. He met his demise at the hands (see what I did there?) of the young hero Brabo, who was able to chop the giant’s hand off and throw it into the river. For this reason, there is a hand statue at the town hall, and Antwerp might be descended from the Dutch hand werpen…to throw a hand. Belgium has a bit to offer for everyone. Maybe it’s because it was once part of Spain, but Belgium just might be my fave non-Mediterranean country. I’m not going to lie, I’m partial to Spain (and Euskadi and Catalunya shhh), Portugal, Italia and Greece and the slower pace of life. Belgium, however, was a nice change of pace, even if it was a bit hard to adjust to eating lunch at 12 or 1 p.m. and dinner at 6 or 7 p.m.! When in Antwerp, do as the Flemish do. Again, there is a lot of the country left to discover (and a lot of the world left for me to discover), but based on my week there, these are the Set Meravelles. There are many more than seven, of course, so if your fave didn’t make the list, sorry! ¡Hay brujas en Brujas! Ok, no witches outside the shops catering to Spanish tourists, but Bruges is a lovely city and the “Venice of the North” due to its canals and medieval charm. If I only had one option for Belgium, this city would be it. Wednesday is market day at Grote Markt. It’s been voted a few times “The Most Beautiful Train Station in the World”, and I can understand why. If only every train station were nice enough to alleviate the rush of trying to catch the next train with beauty. It’s nice both inside and out. 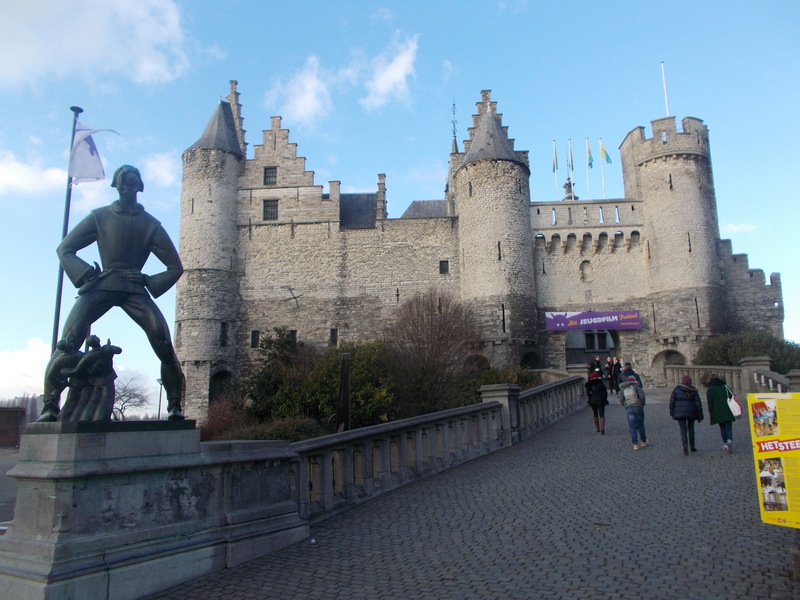 The medieval fortress was the first stone fortress in Antwerp and built to defend against the Vikings. Holy Roman Emperor Spanish King Carlos (Charles) V later rebuilt it and gave it its current name, the King’s Stone Castle. It has been a toll booth and a prison and in 1890 became a museum of archaeology. The “Museum at the River” was opened in 2011, and although it costs money to see the exhibits, it’s free to take 8 flights of escalators to the roof to see some of the best views of the city. The “Little Pee Man” has been a Brussels staple since 1618 or 19. Over the years, it has been stolen several times, and the current one has been in place since 1965. The original is kept at Maison du Roi/Broodhuis in Grand Place/Grote Markt. The most famous legend says that in the 12th century, during a battle with the Berthouts, an infant Duke Godfrey III of Leuven was placed in a basket above the troops. The infant urinated on the Berthouts. Another legend says a small child urinated on a starting fire to put it out which saved the city. There are many more legends and myths about the famous statue. 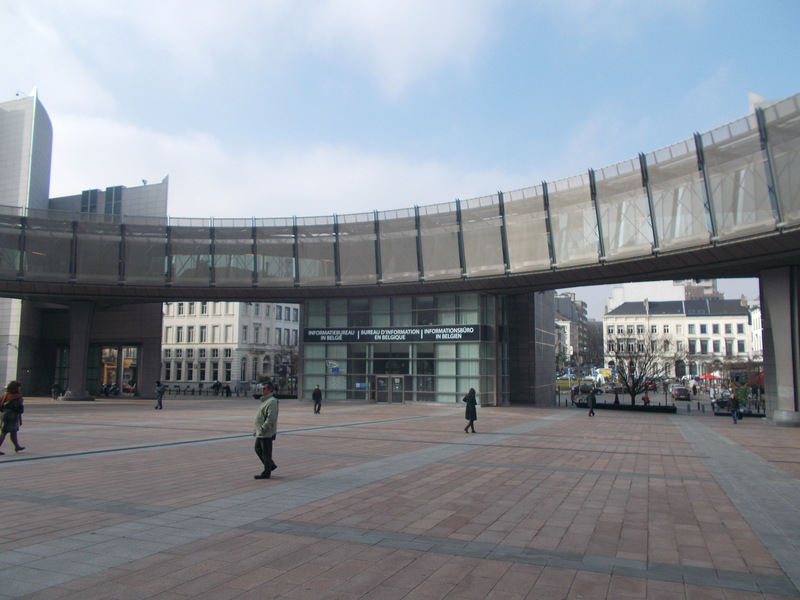 Brussels is the de facto capital of the European Union, which means in the European Quarter of Brussels, the EU meets for many discussions in massive buildings. I, for one, felt a bit intimidated. 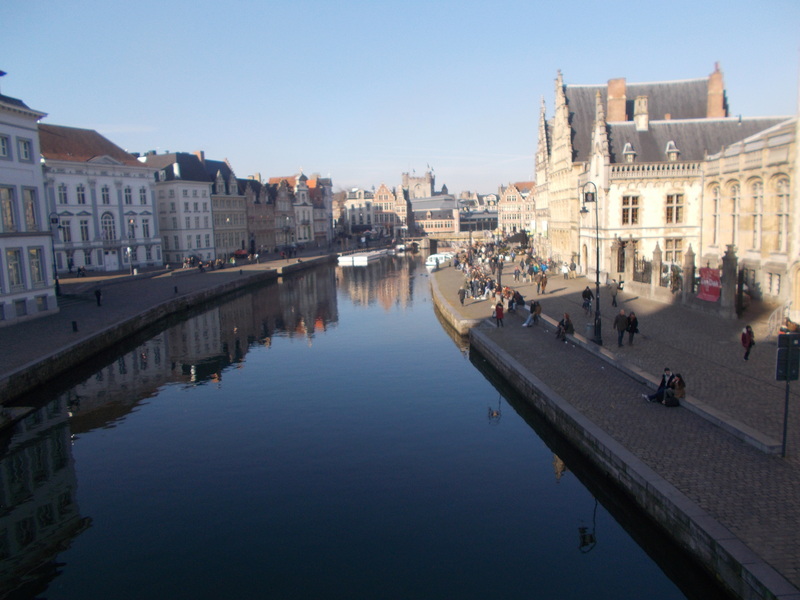 Ghent is a university town with an amazing old quarter located on the River Leie. It’s a shame the rest of the city isn’t as beautiful as the city centre, as you have to walk through some not-so-nice parts to get to the really good parts. Of course, that could be a metaphor for life, eh? 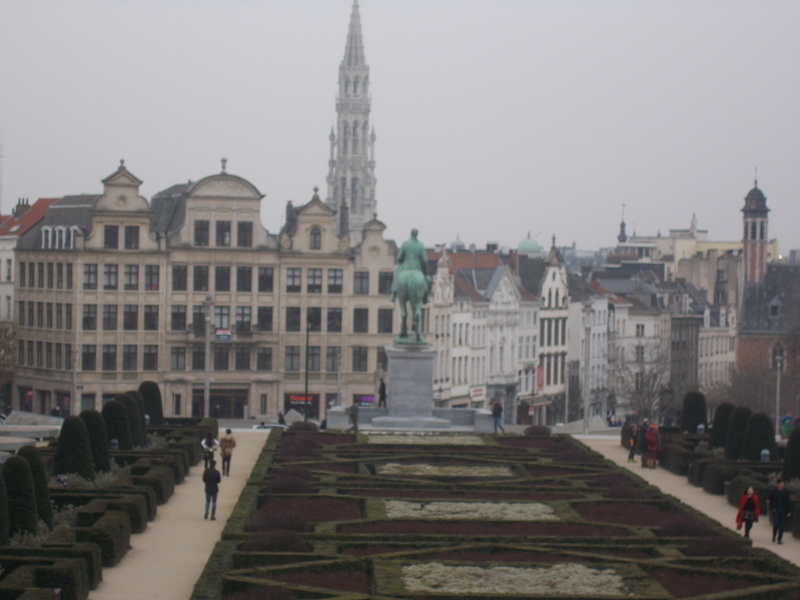 Thursday morning, I went off by myself to see Brussels. From what I had read, it sounded a bit too city for me, and I ended up being right about that. The older I get, the more I prefer smaller cities with a laid back vibe and everything isn’t rush rush rush all the time. With a metro population of 1.8 million, I knew it would be quite different from the Belgium I had seen so far on this trip. While technically a part of the Flemish region (or its own entity, Brussels-Capital region) and bilingual, French is more common here than the Flemish Dutch. I caught the 8.54 train from Antwerp to Brussels and was there in just under an hour. After leaving from the Most Beautiful Train Station in the World Antwerp Centraal, I was a bit disappointed in Brussels Centraal. I made my way to the Grote Markt, better known in its French name, the Grand Place (or what the Spanish would call, Plaza Mayor). It was impressive, but the guide books had built it up too much. I had fallen for the hype and wanted even more. It was beautiful, I will admit. As beautiful to be called the top thing to see in all of Belgium by a guide from El País? No. It took me a while to orientate myself with the map that cost 50 cents at the tourism office in Grand Place. 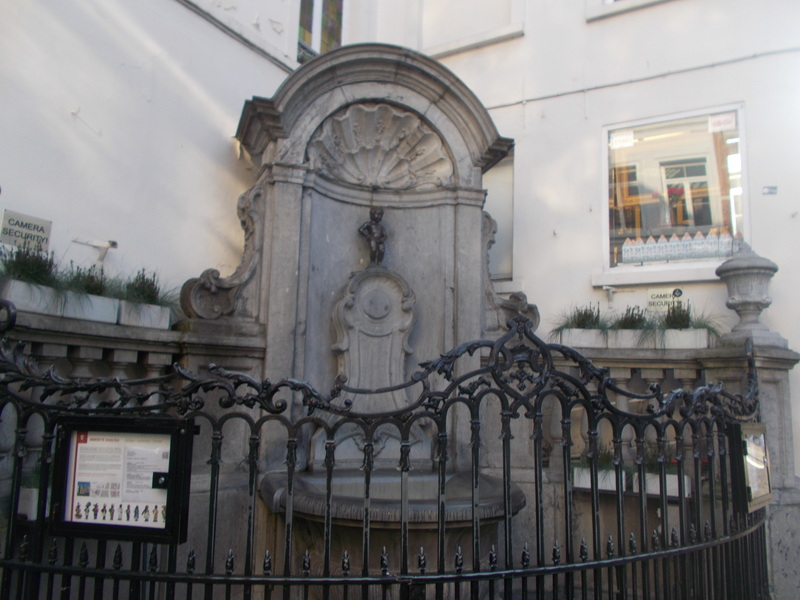 I eventually did and went to see Manneken Pis, a statue of a boy peeing water into a fountain. The statue is one of Brussels’ most famous landmarks and fun to see, I must admit. I had my last Belgian waffle, this one with strawberries so it was healthy, and perused a used-book shop. I found my way to the Bourse, which was an incredibly beautiful building, and to Saint Catherine, a beautiful church nearby. I then made the mistake of taking the metro to the European Parliament buildings. This is by far the most confusing metro I have ever taken in my life, and my Belgian friend later concurred, saying he would’ve advised me NOT to take the metro had he thought about it. The ticket makes for a good souvenir, I guess. The street I randomly took to get to the European Parliament had the Spanish Embassy, and I got all nostalgic for Spain when I saw the flag. I later questioned myself how Basques and Catalans would feel about having to go there should they run into problems in Brussels. I’m too politically correct sometimes! The European Parliament was impressive. Huge. Busy. Modern. I made my way back via the park and the Royal Palace, which was another impressive building. The stairs past the library to the city centre gave some beautiful views of the city. I had a cheap lunch and a café au lait, feeling okay about missing out on the Atomium, a 103-metre (338 yards) sculpture built for the 1958 World’s Fair. If I’m ever back in Brussels, I’ll go back. I saw it from the train, and it looked cool. It just looked like it was going to pour down rain any minute, and it never did. If I had stayed, though, we all know I’d still be drying out! That’s my traveler’s luck. I’m glad I visited Brussels, and for city people, this would be an incredible city. There is a ton to do. 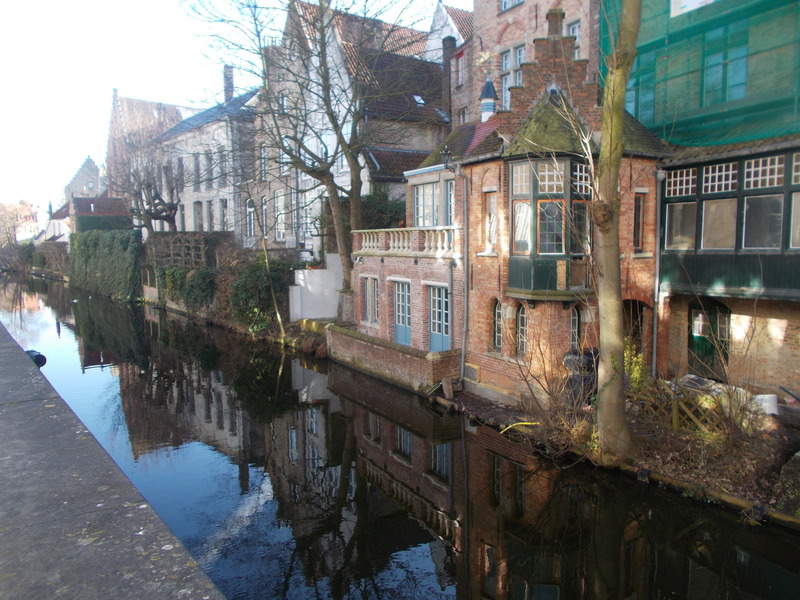 For me, I prefer Bruges, Antwerp and Ghent, smaller cities where I felt more relaxed and not rushed by the trappings of city life. Overall…I’d recommend visiting all four cities if possible. 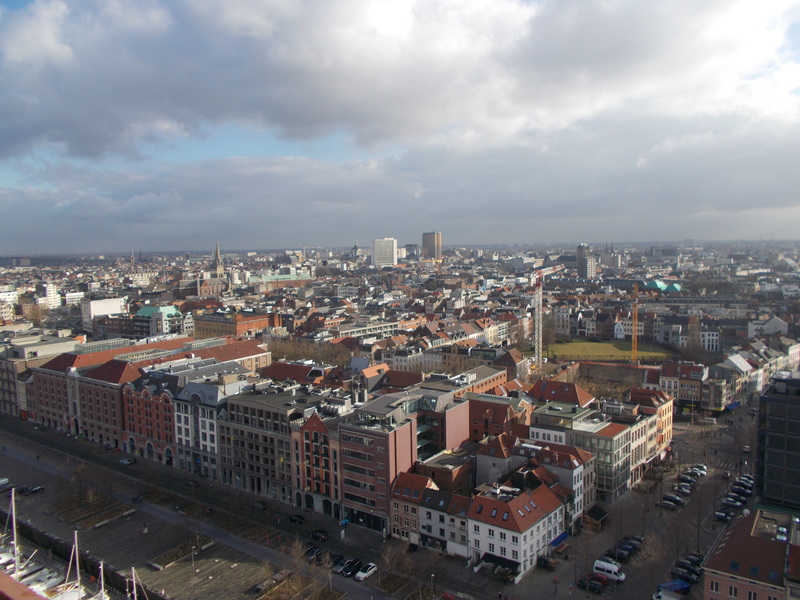 There is a ton to see and do in Belgium, but for this trip, these four cities gave me a great introduction. Next up will be the SetMeravelles of Belgium. 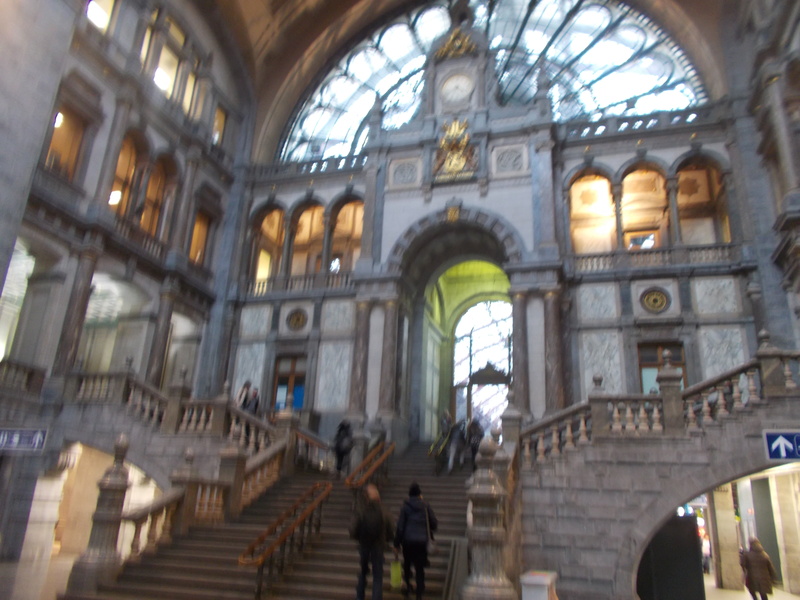 Antwerp, home of the Most Beautiful Train Station in the World. I’ve been through Belgium twice, “de paso”, for two very brief periods of time. On my 2003 European Vacation with my Eurorail pass, I saw Belgium from the train from Amsterdam to Paris, and I’ve always regretted not stopping there to see the country. Then in 2014, coming back from Christmas in the States, I had a layover there of about 20 minutes. It was the one where I made the connecting flight but my luggage didn’t until the following day. I was sort of hoping to have missed the flight for an excuse to get to see the country, but alas, no avail. So when I had an open invitation to visit a friend who I met living in Valencia, I took advantage of a cheap Ryan Air offer (40 Euro return/roundtrip) during my week off in February for Carnaval, something that interests me about as much as Sookie Stackhouse’s Collection of Mosquitos. (I hate dressing up). And this week, I finally got to add Belgium to the list of countries I have visited. I’ll write up the country as a whole and my impressions (and some amusing anecdotes) later, but first I’m going to take a look at my three full days in Belgium. Monday morning, I caught a train to the Santander Airport, which is one of the smallest airports in Spain yet still is functioning and running unlike some that shall remain nameless Castellón Castilla La Mancha. I was able to sleep most of the fight, despite Ryan Air’s best to sell me things I’d never want and an even more expensive meal than the one I just had at the airport. I caught the bus and then train from Charleroi (I mean, Ryan Air would NEVER take you directly to the city ;)) to Antwerp. The journey was about an hour and forty minutes, and the landscape reminded me a lot of my own state, Ohio. It was great to see my friend again, who I hadn’t seen since 2011 over a quick drink in the Plaza de Chueca de Madrid when I first started working there (yikes! I’m old!). After he prepared a typical Belgian dinner of beef stew prepared with beer and potatoes, we went out for a drink at Den Draak. I did try beer, and again, I didn’t like it. Not even Belgian beer. Give me wine any day. The next morning we slept in and tried to wait until the rain stopped before exploring Antwerp. Antwerp impressed me. It doesn’t get the attention it deserves, and perhaps I shouldn’t say that so we can keep it an unspoiled secret. After a typical Belgian breakfast with lots of breads, an egg, coffee and juice, the rain finally stopped and we went exploring. The Cathedral is very impressive, as is the nearby statute. It was supposed to have two towers like Notre Dame, but as they ran out of money, they decided to wait until they had more money to finish it and never got around to it. I liked the staircase façades on all of the buildings. The cafés are all amazingly cool with an awesome environment. Hipsterdom is quite the rage in Belgium, I have to admit. I tried a Belgian waffle that was great. and went to the roof of the MAS art museum for spectacular views of the city. I also must point out that Het Steen was also pretty cool. It is Antwerp’s oldest building and its name means the stone castle. The fortress has been used as a prison and a way of controlling access to the river. The statue at the front is of the Lange Wapper, a mythological (or not) giant who used to haunt streets not protected by the Virgin Mary. Antwerp is also home to an incredibly beautiful train station, one that they are proud of and often wins polls declaring it “The Most Beautiful Train Station” in the world. The city is so full of beautiful and amazing things to see. They are also trying to make an effort to light up one of the bridges as a rainbow to support the LGBTQQA (or whatever the initials are at the moment of reading) community. However, you can only see three of the six colours at any given moment. Another thing I liked was a street full of old, incredibly beautiful mansions (called Cogels Osylei) and the Four Seasons apartment buildings that made up one corner. These buildings are a part of the city’s history, and I am so glad that people bought them in the 70s to keep from being torn down for new, more modern things. We also saw some Belgian chocolate being made, and yes, I had a sample.